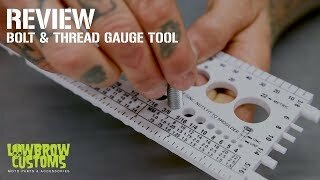 A must-have for any garage or workshop, this bolt size gauge is excellent for sizing bolts, screws, nuts (USS, SAE and Metric), washers (USS, SAE) and twist drills. A unique feature of this tool is that it has both US and Metric thread pitch injection-molded right into it! Simply hold up the threads of your bolt and quickly and accurately check the thread pitch (without having to go to the hardware store or trial-and-error thread different nuts onto the bolt in question). This reliable and accurate tool resists water, alcohol, oil and grease. It measures 8-5/8 inches by 3-1/4 inches, compact enough to slip in your pocket. Very helpful tool for hardware idnentification. Right on! Just what a scouter needed to sort the 14 years of chaos from scout camp projects that were just thrown in Folger's red containers, Maxwell House coffee cans and clear plastic peanut butter jars. Making sense of this jumbled mess, one container at a time! Great tool to have in my tool cabinet. Easy to use and a great help when fixing old equipment by helping me identify old bolt sized.